I was asking me if is possible add to the script, a “counter reset button”, to recalculate the time without the need of refresh the page? I mean, this is with the idea to have different random times in any moment. I didn’t get your idea clearly. Do you mean you want the script to re-calculate the random delay again? Still didn’t get the idea, why re-calculate the delay time will help in multi account environment? Won’t one of the account use aggressive mode will be better? May be you have better method. Probably can add this into your new release. Thanks. Is it possible for you to add an option to pause the screen reload if share charm window pop up? Default can be 0 to skip this or put in a number for the pause time. 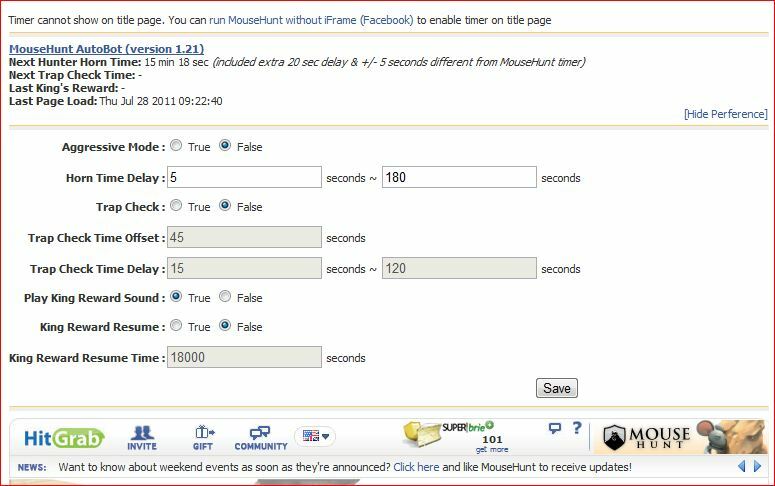 Mind to explain a little bit about the share charm window as I didn’t follow up with MouseHunt game quite some time already. Different types of charm depends on condition can be shared to friend. But if the page reloaded during this, it loses this sharing session. The King Reward resume feature is requested by player where the script will refresh the page after certain amount of time after encountered King Reward. Some player wanted this features as they are running the script at home while wanted to solve the King Reward through mobile or laptop when they go out. Hope you understand what I explain. ahhh. so it only means that you must still type/insert the codes given by the mousehunt king’s reward in the CellPhones or laptop’s in-order to resume it in the computer’s home? yes, you still need to do it manually, the script is not powerful to help you key in the code. Click the show preference then you will see that. Hi Sir Ooi King, sir, why does it the default “Play King Reward Sound” is false? can you pls default it to true bec. I forgot it sometimes to be true when i delete my cache.. Or maybe there is something in the script(notepad) that could be edited to set it to true? Couldn’t i sir Ooi? Take note of that, I think is some bug in the code. Let me check out and fix that. Thanks for telling me. No, not yet. Need to solve some other problem before releasing the script together. Thanx for this script. Can you please add a option to display the full percentage of the hunter’s title? King Reward Resume True False ??? ?